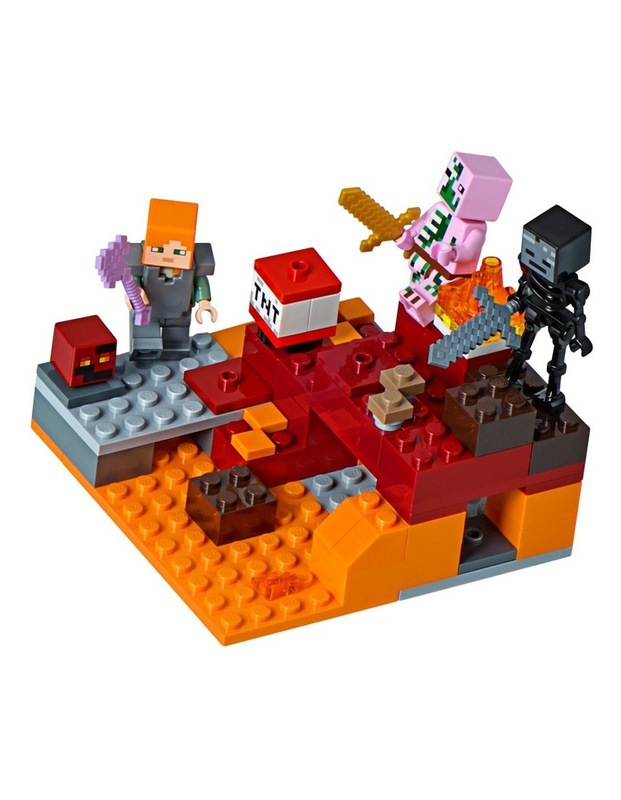 Includes 2 LEGO Minecraft minifigures: Alex and a zombie pigman, plus wither skeleton and small magma cube figures. Features a buildable Minecraft Nether setting with buildable mushrooms and flames, and a TNT blasting function. Don your iron armor, grab your enchanted axe and prepare for action! ? Look out for the zombie pigman with his golden sword! Activate the TNT function to blast out the netherrack and magma blocks. ? Weapons include 2 swords and an enchanted axe. ? Also includes Alexs iron armor. ? Set your imagination freerebuild the set for more LEGO Minecraft creations! This construction toy includes over 80 pieces and is suitable for ages 6-14. ? Measures over 2 (6cm) high, 3 (9cm) wide and 3 (9cm) deep. 84 Pieces.